Mount Rushmore captured my interest in elementary school. No one I knew had ever ventured to South Dakota and the memorial, located so far away, seemed out of reach. And yet, on a recent September afternoon, I fulfilled my childhood dream and there I was, at Mount Rushmore, viewing the spectacular memorial. 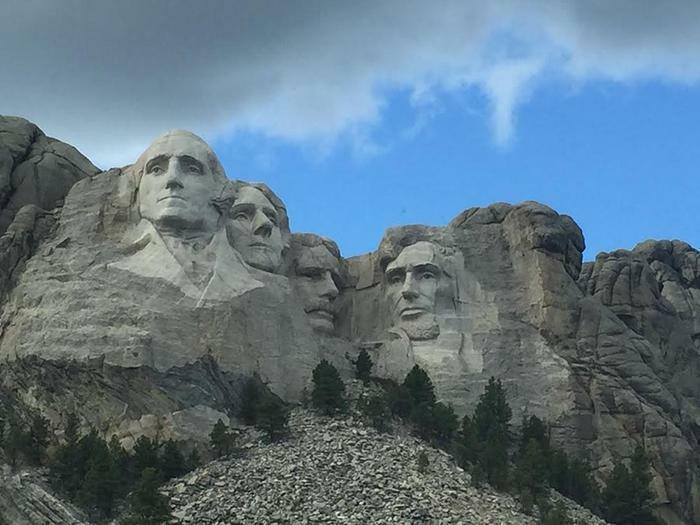 As we approached the memorial from the highway, I glanced over my left shoulder and there they were -- the faces of George Washington, Abraham Lincoln, Thomas Jefferson, and Theodore Roosevelt, four iconic presidents carved high into the mountain. Even from a distance, it was a thrill. We entered the national park by walking uphill through the Avenue of Flags. I had seen this approach in photographs, but viewing the monument through the flags took my breath away. I continued to walk, and as I approached the Grand View Terrace, I had an unobstructed view. It was mesmerizing and I could not stop looking at the memorial. Mount Rushmore filled me with awe and the longer I stared, the more often it changed. The shifting sun and the clouds shaded some facial features and brought others into focus. I took over 30 photos and none are alike. You don’t have to just stand there spellbound, although that’s a fine way to enjoy the memorial. I’m glad I had time to visit the Lincoln Borglum Visitors Center. There’s a lot to learn about Mount Rushmore at its museum, theaters, a bookstore, and ranger desk. I asked a ranger why the eyes look so real and learned that the eye of each sculpture has a 20-inch shaft of granite. This makes the eye seem as if it is twinkling when the sun hits the shaft. Here are some other facts I learned. The memorial was originally conceived by Doane Robinson, the state historian of South Dakota, as an attraction to bring tourists from all over the USA to the Black Hills of South Dakota. His original idea was to honor the West’s greatest heroes that would include Native Americans. Robinson recruited Gutzon Borglum who was carving the face of Robert E. Lee at Stone Mountain in Georgia. It was Borglum who chose the site and persuaded Robinson that the four presidents would be a greater draw. He then created and sculpted the design, dying before the project was completed. His son Lincoln did the finishing touches on the memorial. A senator and congressman were instrumental in getting federal funding in the early years and it became part of our National Park Service. Ending here would not do justice to the true settlers of the Black Hills, the Native Americans. Mount Rushmore was carved on land that is both sacred to the Lakota Sioux and promised to them in perpetuity by the United States government, according to the Fort Laramie Treaty of 1868. The treaty was not upheld when gold was found in 1874 and the Lakota Sioux were then relocated. A visit to Mount Rushmore would not be complete without a visit to the Crazy Horse Monument, just 15 miles away. Here you will find another magnificent sculpture carved into the mountain, one that honors the famous Indian warrior Crazy Horse. This monument, not part of the National Park Service, was commissioned by Henry Standing Bear, a Lakota elder who had originally lobbied to have a Native American represented on Mount Rushmore. Sculpted by Korczak Ziolkowski, who worked on Mount Rushmore, it has been independently funded and operated by the Crazy Horse Memorial Foundation, a private non-profit organization. 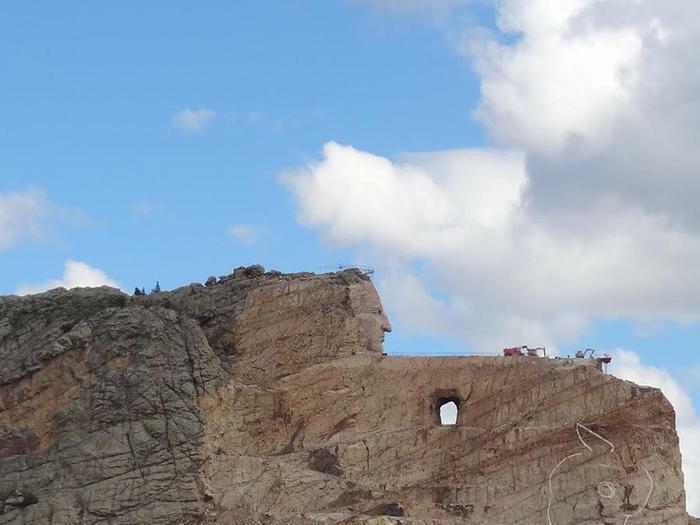 The face of Crazy Horse was completed in 1998, with his horse yet to be carved. After the death of Ziolkowski, his wife Ruth and seven of their ten children carried on the work of finishing the memorial, which is ongoing. These amazing sites tell the story of our nation and the continuing struggles of the American West. They are both glorious and merit a visit.